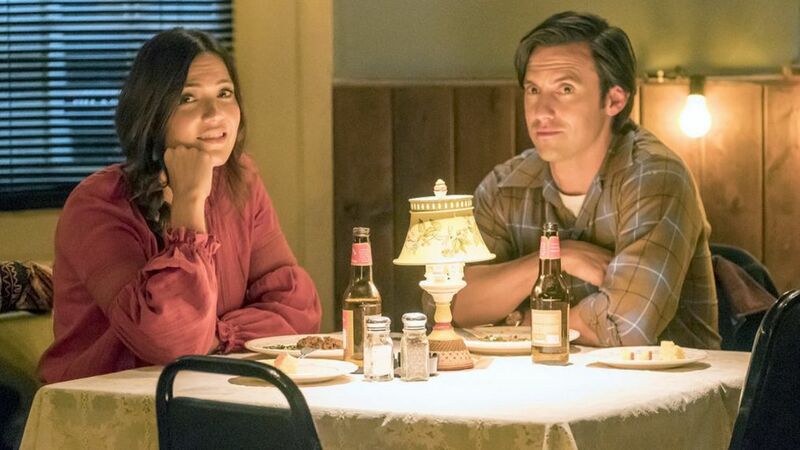 The November 13 episode of This Is Us included many of the emotional moments that viewers have come to expect from the NBC drama, but among one of the standout scenes was Jack's (Milo Ventimiglia) breakdown. In "Sometimes," the show found young lovebirds Jack and Rebecca (Mandy Moore) on an adventure to L.A., where she was going to meet with a record company about her music. After being denied by the company and being called "Pittsburgh-good," Jack asks for Rebecca to sing the song she presented them, as he needed it following a visit with the parents of his deceased Army pal. Earlier in the episode, Jack had mentioned that he didn't really cry about things easily, that he buries those feelings, but Rebecca's song manages to accomplish the impossible when he begins to break down during her serenade. Knowing the history between this couple only elevates the emotional intensity of the situation, considering we know where they're headed in life before these past versions of them know themselves. Now, to make matters even more emotional, a new digital exclusive has revealed that the scene carries a lot of weight for Moore. The actress worked on the original song, "Invisible Ink," with series composer Siddhartha Khosla and her fiancé, Dawes frontman Taylor Goldsmith. When it came to the collaboration, Khosla approached Goldsmith himself because he'd been "dying to work" with the singer and is a "huge fan." Series creator Dan Fogelman had told the composer that Rebecca would need a Joni Mitchell-inspired original song for the episode, and that's how the project came about. "Dan and I spoke before the season started about creating a song for Rebecca," Khosla says. "Dan told me the context of how the song would appear in the episode - Rebecca sings it to Jack, he remembers Vietnam and loses it, but I tried to ignore that visual. Instead I focused on making sure we had a great song first." "I was thrilled to get that call," Goldsmith said about the team-up. "Sid had a whole plan of attack, how to emotionally kind of guide us through what's going on with Rebecca, and gave me all the tools to help contribute what I could." Upon hearing Moore record the song, Goldsmith said, "To hear you in that room, it immediately was like, 'Oh, my gosh, this is This Is Us.'" "It's so synonymous with the show, it just like immediately elicits a reaction," Moore elaborated. "The verses of the song feel like pieces of the score - in fact you can hear some of verse melody in some of the score from the episode," says Khosla. "The song feels like it's right out of the 1970s, classic and timeless like most of the music you hear on the show." Plus, she shares what it was like starring alongside frequent co-star Dan Lauria again. This Is Us executive producer Isaac Aptaker told Entertainment Weekly that they've been wanting to work with Goldsmith for a while on the show. "[We] wanted to bring him in for something," Aptaker said and revealed that Moore "was so excited from the beginning. They collaborate on stuff outside the show, and he's part of the This Is Us extended family, so she was all in." "They just absolutely love working together, and they find a lot of joy from it, so we were just looking for the perfect fit," fellow executive producer Elizabeth Berger echoed. Highlight's Khosla, "Mandy Moore is a rare and exceptional talent. What you hear on the recording is one complete, unaltered live take. That's how good Mandy is. Capturing that magic between Mandy and Taylor was a career highlight for me." Learn more about how the collaboration and song came together in the digital exclusive below, but beware — you may be joining Jack on his emotional roller-coaster by doing so.